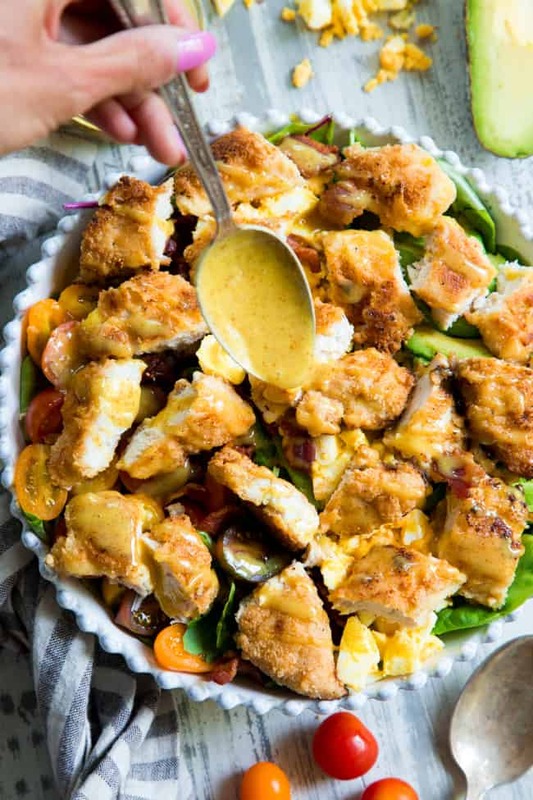 This crispy chicken salad is packed with all your favorites and topped with a perfectly sweet tangy honey mustard dressing! This is the salad I grew up loving, finally made paleo with a Whole30 option! Crispy grain-free “breaded” chicken is tossed with greens, bacon, chopped eggs, tomatoes and avocado to make it just like the classic. 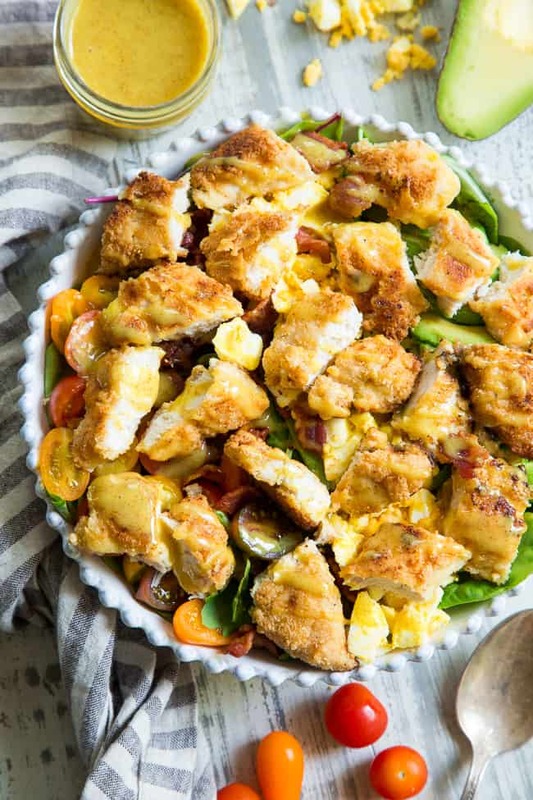 This is a bit of a different recipe than I typically post, mainly because there are so many different components of this crispy chicken salad. So, when you read the recipe – yes – it’s going to look like a ton of steps, but, trust me – they’re all simple and in the end very worth it for this delicious, classic salad! 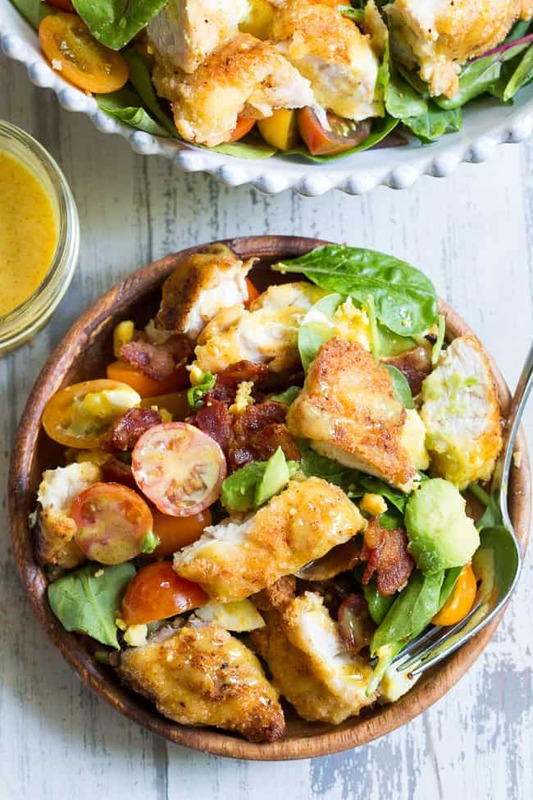 There are so many yummy things going on here – crispy “breaded” chicken, chopped harbored eggs, avocado, bacon, tomatoes, greens, and wait – a honey (or “honey” – I’ll explain in a minute) mustard dressing that’s out of this world tasty! Yup, the salad has a lot going on but we can do this, I promise! There are really two main components of the salad in my opinion – the crispy chicken and the honey mustard. While I won’t say the rest is “decoration”, it’s definitely complementary rather than the focus. Now, let’s chat about the dressing – it’s the part of the salad that will determine whether or not it’s Whole30 compliant. I have lots of recipes that involve a Whole30 option to sweeten a sauce with dates or date paste since it’s a really easy way to sweeten most sauces – and it would be a shame to skip “honey” mustard dressing just because you’re doing the Whole30! The dressing is mayo-free, with just a few ingredients – mustard, honey or dates, lemon juice and olive oil. I made mine in an immersion blender to get that nice creamy texture, but you can also make it in a regular blender OR simply whisking by hand in a bowl. If you use dates, I recommend making it in a blender or food processor since you’ll have to blend up the dates anyway. 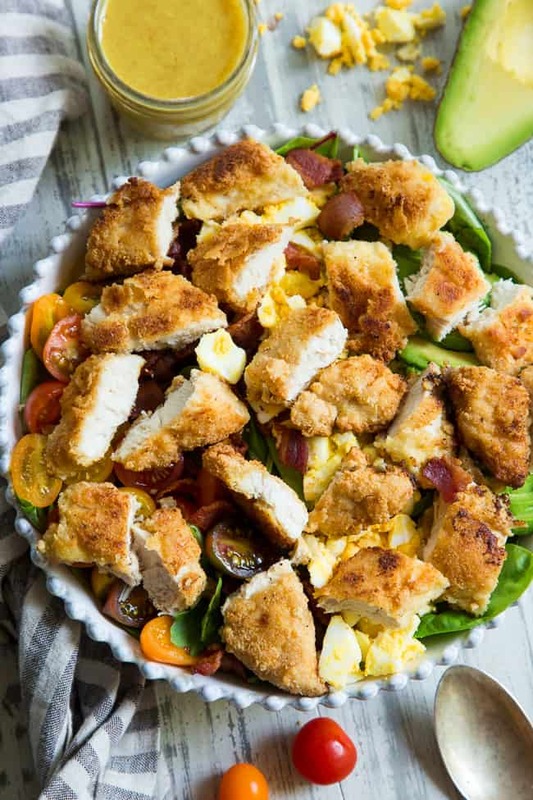 While I won’t say the dressing “makes” the salad – it’s probably my personal favorite part of this salad since it was my favorite dressing growing up – especially with crispy chicken! The chicken itself is based on my chicken cutlet recipe except without the coconut flour and extra spices. 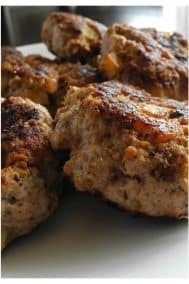 A mixture of almond flour and arrowroot or tapioca make the outside of the chicken nice and crispy, and, although you have to go through the process of dredging and pan-frying the chicken, it’s SO delicious that you’ll forget you’ve done any work once you take that first bite. 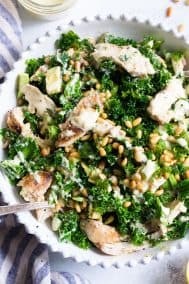 This salad is perfect for dinners and you can even save leftovers for lunch the next day as long as you keep some of the dressing on the side and chicken separate – you can reheat it the next day right before eating. I don’t know about you guys, but a good classic crispy chicken salad was one of my favorite things to order growing up and re-making it paleo and Whole30 friendly is not only FUN but satisfies a craving I haven’t even thought about for years! I hope you enjoy this salad as much as I did – it’s time to get started now – let’s cook those bacon and eggs and GO! 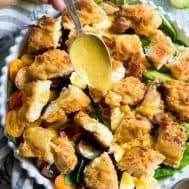 This crispy chicken salad is packed with all your favorites and topped with a perfectly sweet tangy honey mustard dressing! This is the salad I grew up loving, finally made paleo! Crispy grain-free “breaded” chicken is tossed with greens, bacon, chopped eggs, tomatoes and avocado to make it just like the classic. Dressing: prepare this first and refrigerate until ready to use. For non Whole30 version, place all ingredients in a tall mason jar wide enough to fit an immersion blender. Place blender in the bottom and blend on high until fully combined - it should have a drippy, yet creamy texture. If you don’t have an immersion blender, whisk all ingredients EXCEPT for the oil in a bowl, then, slowly stream oil into the bowl while continuing to whisk until fully combined. For Whole30 version, place dates, water, mustard, and lemon juice in a high speed blender or food processor and blend on high until pureed. Then, with the blender continuing to run, slowly stream in the oil until fully combined. 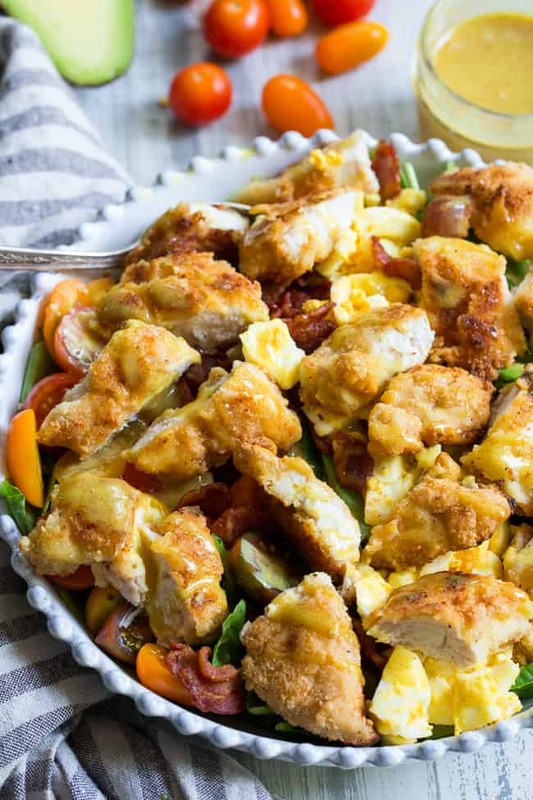 Have your bacon and eggs cooked, crumbled, chopped and ready to go before making the chicken. Mix almond and arrowroot flours in a shallow bowl and add the salt. In a separate shallow bowl, whisk the egg. Heat a large skillet over medium-high heat and add the coconut oil. 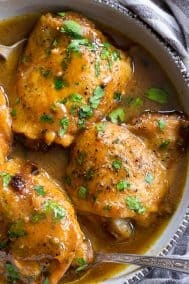 Once sizzling hot, (breading with soften and fall off if oil isn’t hot enough) dip a piece of chicken in the egg, shaking off excess, coat with dry mixture, and place in the skillet. Repeat with all chicken pieces. Cook on one side until golden brown, about 3 mins, adjusting the heat if necessary. Turn carefully using tongs so as not to lose the “breading”. Cook on the second side until golden brown on the outside and cooked through inside - about 6 mins total depending on thickness. Remove chicken to a paper towel lined plate and allow to cool a bit. While chicken cools, assemble the salad - layer the greens with the bacon, chopped eggs, tomatoes, and avocado. Slice chicken as desired (you can also leave the tenders in tact and arrange over the salad) and serve immediately with dressing drizzled over or on the side for dipping. Enjoy! *for Whole30 version, use 1/2 cup packed pitted medjool dates, softened + 3 Tbsp water, and blend in a food processor. This looks fabulous…BUT…am I somehow ‘missing’ the instructions for the meat component?! I only see the recipe from the dressing portion of the recipe?! Many thanks…and gorgeous photography by the way! Hi! The instructions are #3 in the “make the salad” section. Enjoy! I’m obsessed with this salad. The dressing is so good. Sometimes my husband and I just make the chicken tenders and the honey mustard if we aren’t in the mood for a salad. This looks delicious! Do you have directions for making the chicken in the air fryer?